Quinton Heights custodian Brian Apodaca is the Above and Beyond winner for the month of March. He was nominated by the Quinton Heights staff for his hard work preparing the building during the summer of 2011 and his dedication to quality as he maintains the Quinton Heights facility. When Quinton Heights was repurposed to be used for the English Language Learners/Migrant Programs, Parents as Teachers and the Special Education Preschool last summer, Brian had the task of converting the facility from an elementary school to housing these programs. He moved desks, boxes, bookcases, filing cabinets and a myriad of other heavy items for 40 people. He moved equipment and materials from one room to the other, in and out of the gym, and to the shed and trucks. Sometimes, he had to move things more than once. 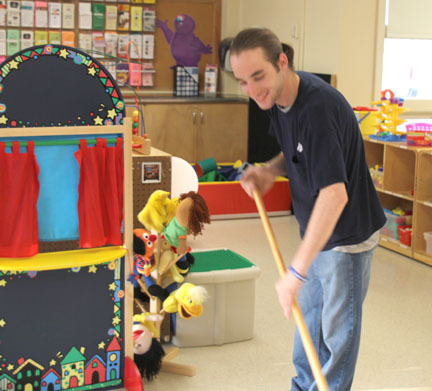 He did all of this while maintaining the cleanliness and upkeep of the building and preparing it for the first day of school. The preparation included stripping and re-waxing all of the facility floors. Parent educator Yvonne Guy says, "Brian continually amazes us with his knowledge and quick-thinking. He responds quickly, thoroughly and efficiently." Quinton Heights secretary Joleen Weber adds, "He's always there when we need help and he is quick to respond when the kids need something. He's very pleasant to be around." If you know of a staff person, parent or community person who goes above and beyond to serve the students of Topeka Public Schools, nominate them for the Above & Beyond Award. The nomination form can be found here.